Until aliens actually arrive, there’s no way to know for sure what life on other planets looks like, or if it even exists in a way that resembles the human race. The most common trope associated with aliens in media, aside from the notion of little green men, is the Unidentified Flying Object that mysteriously and ominously passes overhead, sometimes to abduct unsuspecting humans for unknown purposes or merely to light up the sky and signal that there is something else out – or, more accurately, up – there. What comes after the UFO shows up varies in every science fiction story. Sean (Theodore Pellerin) spends most of his time looking after his little brother, who manages to get himself into plenty of trouble, and his grandmother, who has recently become immobile and unresponsive. When he sees his ex-girlfriend Alex (Stefanie Scott) at a party with someone else, he writes his phone number on her arm to inspire her not to forget about him. After Alex vanishes while swimming with her new boyfriend, she awakens a different person, not sure of what she has become. 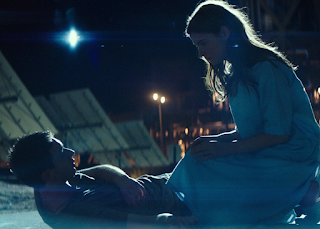 She calls Alex and implicitly trusts him, experiencing new and unexplained abilities as she soon becomes the subject of much interest in a town where one determined scientist (Said Taghmaoui) is tracking ships that flew overhead and certain that they are connected to what has happened to Alex. This film’s alien-related plot is reminiscent of the short-lived TV series “Invasion,” in which humans were transformed in the water to become alien hybrids, still in control of their minds and motor functions for the most part but affected by new impulses and powers. The surrounding story here finds two people fighting to overcome the odds, to ensure that Alex isn’t captured and experimented on or separated from Sean, who hasn’t stopped caring for her in the aftermath of their breakup. It’s a slightly sentimental romance but not a terribly effective one, with neither character proving to be excessively emotive or complicated beyond their surface appearances and the obvious alien influence. This film doesn’t feature any big stars, with Shonda Rhimes favorite and Emmy nominee Kate Burton serving as the biggest name in the cast as a government agent investigating Alex’s condition and what it means for the human race. Neither Pellerin nor Scott impresses all that much, but it’s also a result of lackluster writing. This film’s overarching themes, which are reminiscent of the unconventional alien film “Monsters,” are stronger than its actual content, which is slow-moving and directionless, reaching a conclusion that is likely supposed to feel epic in nature but fails to deliver.